Currently in previews are two London productions of Henrik Ibsen’s 1881 drama Ghosts. At the Almeida Richard Eyre is directing his own adaptation with a cast led by Lesley Manville, Will Keen and Jack Lowden, while at The Rose Theatre in Kingston Stephen Unwin is also adapting and directing and has Kelly Hunter, Patrick Drury and Mark Quartley as, respectively, Mrs Alving, Pastor Manders and Oswald. For such a gloomy and, when it was first written, controversial tale of what appears to be the sins of the father being visited upon the son, the play has proved surprisingly popular for television. Just a year after the start of transmissions from Alexandra Palace, on 15 November 1937 Royston Morley produced an extract from the play in the production by Esmé Church that was then on at London’s Vaudeville Theatre. Following this, there have been six further television productions, although recordings of only three are extant. ABC-TV contributed an adaptation to ITV’s Armchair Theatre strand on 22 September 1957, with George More O’Farrell as director. And there was a further BBC presentation in 1962, shown on 26 January and directed by George R. Foa with Katina Paxinou, Paul Rogers and Barry Foster; this is the first one to survive. Michael Elliot’s version for Play of the Month, shown on 17 March 1968, is lost, but the YTV production directed by David Cunliffe and shown on 26 July 1977 remains in the archives. As does the most recent television adaptation, directed by Elijah Moshinsky and broadcast on 14 June 1987 in the short-lived BBC series of classic drama, Theatre Night. This last, which is available on the Judi Dench BBC Collection DVD box set, is the subject of today’s post. 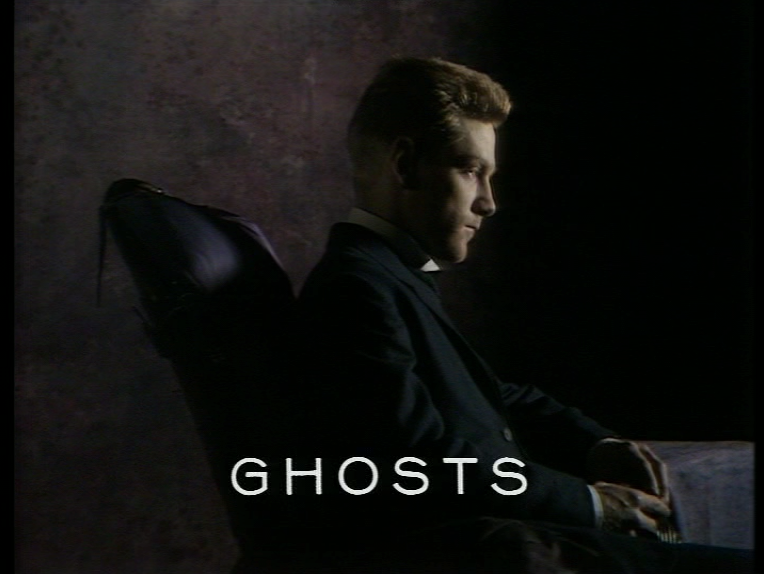 In 1987, as awareness of HIV/AIDS became widespread, Ghosts‘ central subject matter of a debilitating venereal disease transmitted from a father to a son must have seemed strongly topical. The play had already been seen in a different version earlier in the year in the West End, at Wyndham’s Theatre, with Vanessa Redgrave and Tom Wilkinson. Yet there is little sense here of the shock and disgust that audiences apparently felt when they first read the play in 1881. 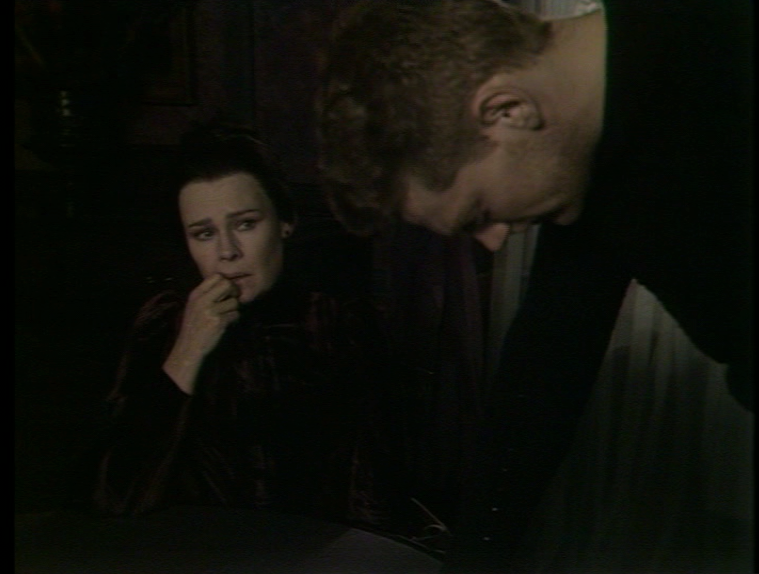 Ibsen’s drama has only five characters: Mrs Alving, a free-thinking widow once in love with Pastor Manders and now about to mark the passing of her husband by opening an orphanage dedicated to his memory; Manders, a strait-laced priest concerned above all to maintain decorum; Mrs Alving’s artist son, who has returned home with, as it turns out, a fatal dose of syphilis (although this is never specified); Regina, the maid of the Alving household, who it emerges is the daughter of the late Mr Alving with a previous domestic servant; and Engstrand, a local workman who took in Regina’s mother and has brought up Regina as his daughter, although at the start of the play he is unaware of who her true father. With a fine translation by Ibsen biographer Michael Meyer, the 1987 production was cast to the gunnels, with Judi Dench, Michael Gambon, Kenneth Branagh, Natasha Richardson and Freddie Jones. 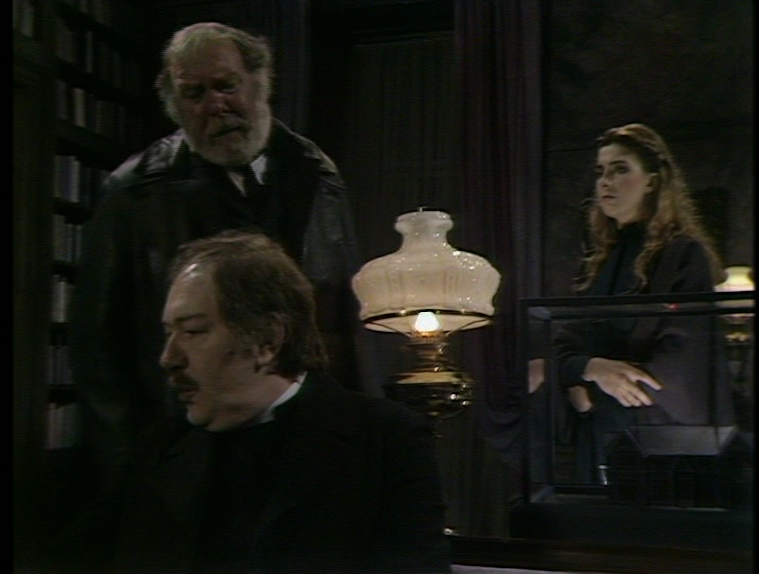 The television previewer for The Sunday Times, Sally Payne, wrote that ‘An awesome cast brings a rich, volcanic intensity to Ibsen’s sociological gloom’ (‘Television Choice’, 14 June 1987, p. 60). But while there is unquestionably a pleasure in seeing actors of this calibre, Gambon, Richardson and Jones seem to me never really to inhabit their characters. 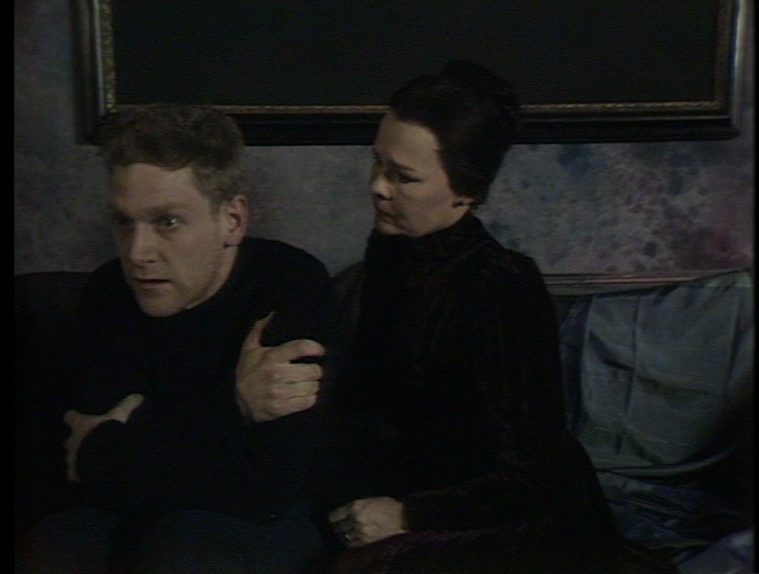 The latter pair in particular speak their lines in distractingly ‘posh’ tones (especially given their supposed background), and it is only as the play increasingly focuses on the mother and son relationship, and on Dench and Branagh, that it draws in the viewer. The production’s distinction is due far more to the visual style than to the performances. Working entirely in a studio set of inter-connecting rooms by designer Gerry Scott, director Moshinsky draws on traditions of nineteenth- and early twentieth-century painting to compose a drama of shifting relationships played out in deep space for the camera (Fig. 4); of figures silhouetted against windows, as in numerous paintings by Vilhelm Hammershoi (see Fig. 3), and of occasional specific references to particular paintings, as with the nod to Gustav Klimt’s Fulfilment, 1905-1909 (Fig. 7) and an echo of Edward Munch’s The Scream, 1895 (Fig. 4). The visuals of Moshinsky’s studio dramas are invariably self-conscious – and strikingly elegant – responses to aspects of European painting, as in his 1983 Cymbeline set in a seventeenth-century Dutch court seemingly designed Van Dyck and Rembrandt. 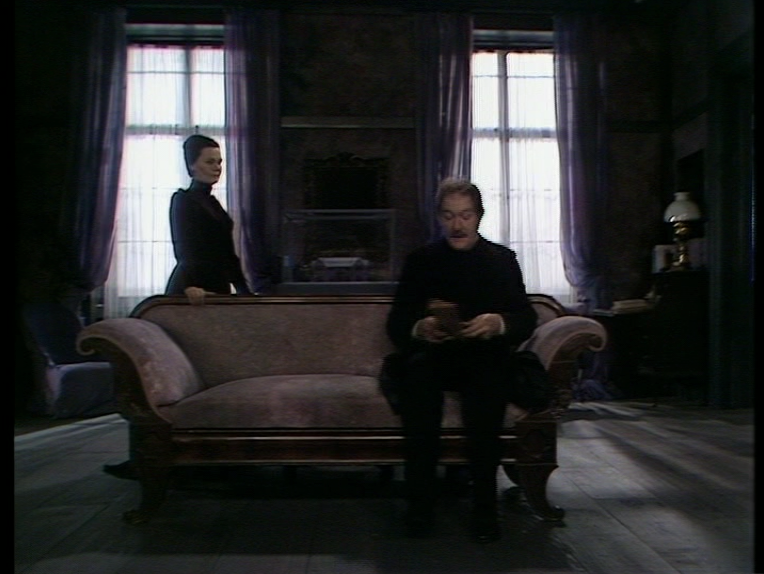 In Ghosts the subdued palette is close to monochrome, with blacks and dark blues and purples predominating, and the overall sense of Clive Thomas’ lighting is dark and oppressive. Set against this are the bright white windows which offer no details from the world beyond. 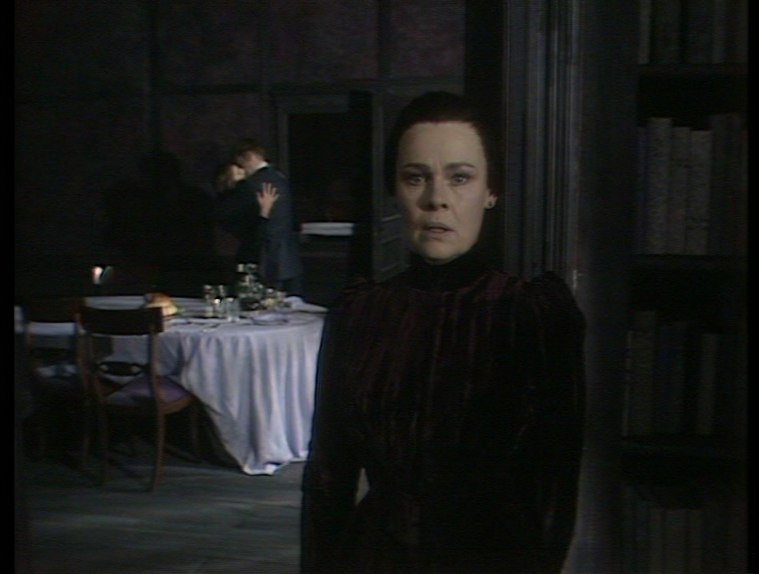 Yet more than twenty-five years ago studio technology and electronic cameras could not really do justice to the subtle (and symbolic) lighting changes that Ibsen determines across the eighteen hours or so of the action. Even so, this is a production to be appreciated more for its visual complexity than for its acting. The placing of the figures often reflects the shifting sense of power between the characters, as when Engstrand looms over the seated Manders to blackmail him. 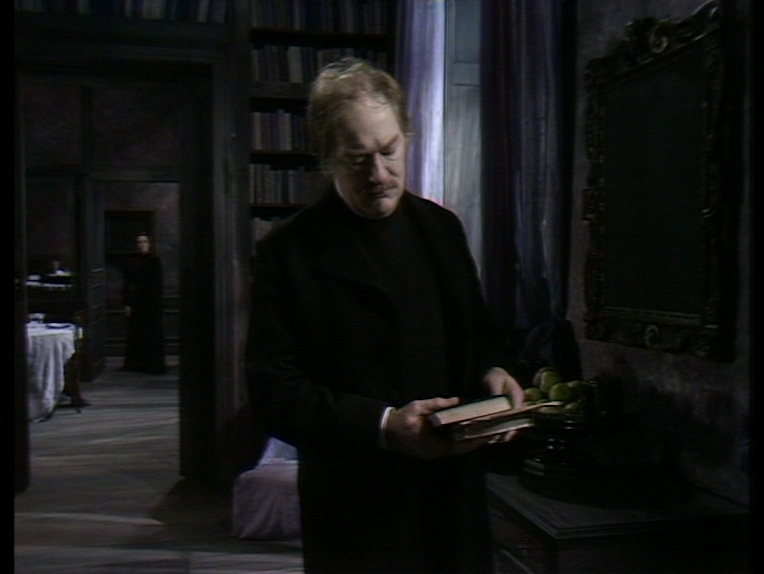 As already noted, there is a striking use of deep space with characters sometimes seen two rooms away through the doorways of the set. The wooden floor produces footsteps with a clarity rare in studio drama and just occasionally there is a glimpse of a ceiling over one of the central rooms. The production is one of the last of the major classic dramas to be recorded in a studio and, in technical terms, it is a fine demonstration of the sophistication that the form could achieve. The closing ten minutes, however, played between just Mrs Alving and Oswald has a different register from that which has gone before. Here the cameras are complicit in an intense exchange that is desperate and devastating. Moshinsky confines his actors to a sofa, cutting the lines in which Mrs Alving shouts out for help as she rushes into the hall. Branagh’s final attack is played quietly, and it is as if we are eaves-dropping on this most intimate of moments, as Mrs Alving tries to decide whether to administer a fatal dose of morphine. This was the moment at which my distanced admiration for the production shifted to become true emotional involvement. She notes how the interval between, presumably, Act 2 and 3, ‘breaks the spell’. At the Almeida, the play is played straight through without an interval and lasts around 100 minutes. Thanks for this. After I saw the Almeida production on Friday, I looked for the BBC version on dvd. For some reason, I could only find it in an Ibsen / Region 1 boxset. The Judi Dench collection is much more within my budget. I will come back to your post after I have watched it. Thanks – it makes a fascinating comparison, especially in the performances of the two actors playing Oswald. I’m going to see The Rose production tomorrow night, Wednesday, and then I’m going to try write something that compares all three. This is a splendid post. I’ve always had a great affection for this production, which I watched when it was first on, and have since seen on the big screen at the NFT in the late-90s and on DVD in the 2000s. Moshinsky’s use of lighting and camerawork really build on his work on the late BBC Shakespeare’s (I’m thinking particularly of ‘Cymbeline’ here) and he creates a very unusual ‘world’ for the play to happen in. By contrast I was watching the David Cunliffe one last week and although that’s only a decade older it could, were it not a colour-625-line transmission, be from the late 50s, and seems to mainly be set in a television studio. It has a similar atmosphere to either a Cedric Messina ‘Play of the Month’ of a Joan Craft ‘Classic Serial’, and compared to Moshinsky’s production, shows just how far the technique of directing videotaped studio-based drama developed in a few short years. It’s a crying shame that no one is making drama in this way today. Many thanks, Gordon. Can I ask if the David Cunliffe version is available anywhere? I’ve not seen that and now would very much like to. The (wholly misguided) feature-length 1993 ‘Casebook of Sherlock Holmes’ story ‘The Eligible Batchelor’ includes a peculiar scene of Holmes skulking in the wings of the Royalty Theatre and watching a rehearsal of the climax of the original production!